An estimated 405 million people – or about 6% of the world’s total population – are adherents of folk or traditional religions. These are faiths that are closely associated with a particular group of people, ethnicity or tribe. They often have no formal creeds or sacred texts. Examples of folk religions include African traditional religions, Chinese folk religions, Native American religions and Australian aboriginal religions. Folk religions are challenging to measure. Less institutionalized and more diffuse than many other faiths, folk religions often are omitted as a category in surveys even in countries where they are widely practiced. For example, though folk religions are pervasive in China, they typically do not appear in surveys in China because they are not one of the five religions officially recognized by the government. Of necessity, the Pew Forum’s estimate of the number of folk religionists in China relies instead on survey questions about worship of gods or spirits associated with Chinese folk religions (see discussion in the Methodology). In addition, the boundaries between folk religions and other religions are blurry in some contexts. For example, anthropologist Tik-sang Liu observes that for ordinary people in Hong Kong and Macau, “there is no clear boundary between Buddhism, Daoism and local [folk] religious practice.”13 On the basis of the limited data available on religion in Macau, the Pew Forum estimates that about 59% of its people practice folk religions and that 17% practice Buddhism (this was the share of Buddhist affiliation measured in the 1991 census, the last census to measure religion in Macau). However, some recent descriptions of religion in Macau contend that 80% of its population practices Buddhism; presumably, this broad measure includes folk religion as part of Buddhism. Due to the uncertain boundary between folk religion and Buddhism in Macau, this study does not claim that Macau has a clear majority of folk religionists. In sub-Saharan Africa, many of those who indicate that they are committed to the practice of Christianity and Islam also incorporate elements of African traditional religions into their lives.14 Moreover, folk and traditional religions are not always offered as response categories in large-scale demographic and health surveys in the region. Folk religionists are most prevalent in the Asia-Pacific region, where nine-in-ten of the world’s folk religionists (90%) reside. The remaining folk religion populations are concentrated in sub- Saharan Africa (7%) and Latin America and the Caribbean (between 2% and 3%). Although the majority of folk religionists live in the Asia-Pacific region, less than one-in-ten people in the region (9%) are folk religionists. Folk religionists make up about 3% of the total population of sub-Saharan Africa and 2% of the total population of Latin America and the Caribbean. 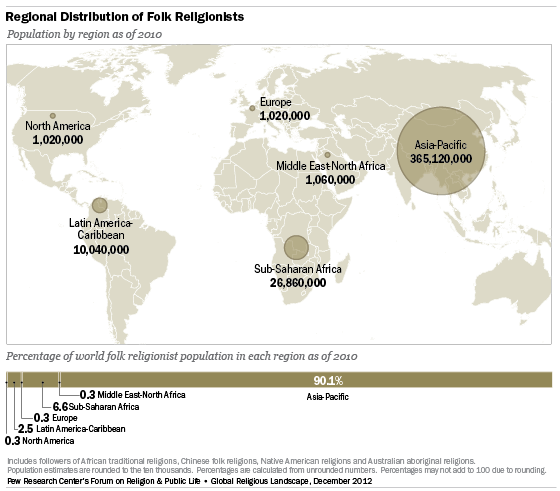 Folk religionists make up less than 1% of the population in the remaining regions. More than seven-in-ten (73%) of the world’s folk religionists live in one country, China. The largest populations of folk religionists outside China are in Vietnam (10%), Taiwan (3%), India (1%) and Brazil (1%). 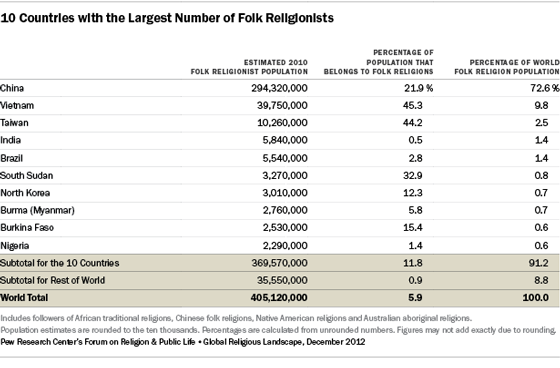 Practitioners of folk or traditional religions do not make up a clear majority of the population in any country. Globally, folk religionists are older (median age of 33) than the overall population (median age of 28). Among the three regions for which data are available, sub-Saharan Africa has the youngest folk religionists (median age of 18), followed by Asia and the Pacific (34) and Latin America and the Caribbean (35). The median age of folk religionists in sub-Saharan Africa (18) is the same as the median age of the general population in that region (18). 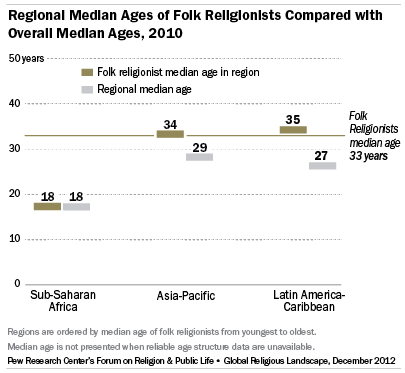 However, folk religionists are older than the general population in the remaining regions for which data are available: Latin America and the Caribbean (folk religionists 35 years; general population 27 years) and Asia and the Pacific (34 vs. 29). Quiz: How much do you know about Christianity around the world?